Yesterday I posted a defense of creationism. I would guess that some fundamentalists cheered. “Not so fast, my friend.” I’m not on anybody’s side. I’m on everybody’s side which if you think about it, means I’m opposed to sides altogether. I’m trying to get people to talk, and listen to one another. And to do that, I have to convince people that we’re all nuts. I have taught college biology on occasions, and typically on the first day I ask for a show of hands from those who don’t believe in evolution (or Darwinism). There are always a number of kids who don’t. First, in any species — animal, plant, whatever — there are many more offspring produced than can possibly survive. Second, some individuals will have advantages that help them survive, they will be stronger, faster, smarter. Again, no objections. Third, some of those advantages are ‘heritable,’ they can be passed on to offspring. Any objections so far? No. And then I tell them, That’s it. That’s all the theory of evolution says. It says nothing about God, the origins of life, or who created humanity. From this we see that creationists and Darwinists can all agree on intraspecific, ‘small’ evolution, the sorts of things that give us different varieties of sheep and cattle. The problem is not evolution, the problem is the extent of evolution; as we say in pharmacology, “It’s not the drug, it’s the dose that makes the poison.” At least we have a starting point where fundamentalists and scientists agree, and that’s not small. 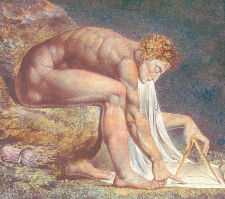 Picture: William Blake, “Newton”, courtesy of Wikimedia.org. Compare to yesterday’s picture, “Ancient of Days” also by William Blake. Makes you wonder why there is such a strong argument between the folks who support creationism and those who support evolutionism? Is it that the evolutionists misunderstand that Darwin’s theory does NOT preclude creation by “smart design”? A little of that I touched on in the previous post, but I’ll come back to it in the next few posts (I’m chopping them up, I was worried I was losing people because they were so long). But part of the answer is, for many scientists science is a religion, and they approach dissenters with the same intolerance and closed-mindedness that fundamentalists do in theological religions. Difference of opinions isn’t nearly as much of a problem as the intolerance of difference of opinions. Mrs. Hanna would be proud! I’ve enjoyed somewhat of a reunion with Latin in the classes I teach since my students study Greek and Latin stems as their vocabulary. You make it sound so simple. Even Darwin was troubled about the ramifications of his observations. Is it any surprise that others still are? I am reminded of the quote from The Fantasticks: “Remember, Mortimer, there are no small actors. In this case, there are no simple people, only simple problems. I jest of course. Part of where I’m going with this blog — and, I suppose, with a lot of my life — is to convince people (myself included!) that a problem is only as simple as our understanding of it. The closer we look, everything becomes more complicated. And more fascinating. Which should fill us with both wonder, and humility/doubt. I am fascinated by Darwinism, it is a simple, elegant solution to so much of life. I will use it throughout my posts here. But it does not yet explain everything, and perhaps one day we will decide that it explains nothing. That may sound ridiculous today, but the history of science is filled with examples of what one generation ‘knew’ to be true, the next discarded. And either way, if we do not keep doubt and humility alive, we will miss important insights.